1. Cheap trades. As of writing, it's $3 a trade with the standard plan, and $1.50 a trade with the premium plan, which costs $10 a month. If you make seven or more trades a month, you're better off going with the premium plan. Depending on how many trades you make per month, this is comparable to Sharebuilder's and Zecco's pricing. 2. Automatic scheduled investments allow you to buy fractional shares. SogoTrade lets you schedule when you want your plan to start and how often you want to invest a certain amount. (Note that there is a $100 minimum per scheduled investment, but not per stock. For example, you can invest a total of $100 split among a number of stocks--not that this would be wise, considering the commissions you would pay in such a case.) According to Sean Muir, PR person at SogoTrade, automatic investments can be scheduled for any day the market is open. For some reason, though, all my automatic trades happened on Tuesdays. 3. Free dividend reinvestment. SogoTrade lets you decide for which stocks you want your dividends reinvested. Update 12/6/08: SogoTrade has terminated their automatic scheduled investments, factional share purchases, and automatic dividend reinvestment program. All existing plans will be canceled on 12/31/08, and all fractional share holdings will be sold (commission free) on 1/6/08. Live chat with customer support: It's really easy to find, with a link displayed prominently in the upper right corner of every page. I used this feature several times on several different occasions, to ask silly questions about future features, legitimate site navigation questions, and the like. Each time, I was answered right away. It took the customer service rep about 1 minute to respond every time. The answers were always helpful. Email: I emailed support with lots of silly questions, some of which required lengthy explanations. During business hours (SogoTrade is open from 8 A.M. to 9 P.M. Eastern Time on weekdays, excluding holidays), the average response time to my email questions was under an hour. I never had to wait more than two hours. Emails sent over the weekend were responded to on Monday morning. The answers were always relevant and helpful. Phone: Someone picked up right away each time I called. They were friendly and helpful. I am interested to see how this goes as SogoTrade grows its customer base. 6. Easy to use site layout (for the most part--I had some difficulty finding out how many free trades I had left, as well as the stock screener). 7. The hypothetical portfolio tool lets you paper trade stocks and ETFs. a. Apply for an account online. Answer the usual questions that all brokers ask. This took me about 10 minutes. b. Once you submit your application, you have to wait for an email from SogoTrade, approving your account. In my case, I started in the early afternoon, and got the email in the early evening. This took about three to four hours. c. After receiving the email, I had to print and fill out an account signature form and an account funding form. These are simple forms and took a couple of minutes to complete. The account signature form asks for a copy of a driver's license or some other official id, like a passport. I have a copier at home, so this took me another minute. The account funding form asks for a voided check. If you want to use your savings account to make deposits into Sogotrade, you have to make a copy of or print out a monthly statement. The entire process took me less than 10 minutes, but it may take longer in your case, as you might not have a copier/printer handy. d. If you want to make deposits into SogoTrade online (this is the fastest method), you have to get your bank accounts verified. Entering your bank account information takes a couple of minutes at most. SogoTrade then makes two small deposits into each bank account, which you have to verify by logging on to your bank's site (or whatever method you use to view your statements) and entering the information at SogoTrade's site. In my case, this happened the next day. If you start this process on a Friday, you might have to wait for Monday or Tuesday. As of writing, SogoTrade does not provide instant account verification. e. At some point after c., above, you have to mail the forms you filled out, along with your voided check and a copy of your id. Unlike other brokers, SogoTrade does not as yet accept faxed versions of these documents. (But see comment below, where user was able to fax all documents.) You cannot make electronic deposits into your SogoTrade account or trade until these documents are received and processed. Sogotrade's office is in New York City. I put my envelope into a mail box practically at SogoTrade's doorstep. It was a week before I was able to initiate a deposit. If you live farther away, I imagine it will take longer. There is also the issue of sending your identification, bank account, and broker information through the regular mail. Do you feel safe doing so? f. Once your forms are received and processed, and you have verified your bank account online, you can initiate a deposit. This takes at least two business days. That is, if you initiate the deposit on Monday, you will be able to trade with that money on Wednesday at the earliest. I was able to place a trade 11 days after I applied for an account. It's not that much of a burden, but compare SogoTrade's account opening process with TD Ameritrade's: apply for an account online, verify your bank information, make a deposit, trade. It took me 15 minutes, and I never had to leave the computer. 2. The stock screener is hidden away, and is the bare minimum in terms of power. I had to look through the site map to find it. You're much better off using a free one, like Yahoo's or MSN's. 3. The ETF screener is just as bad as the stock screener. 4. You can't specify a limit price for automatic investments. They're made at market price. 5. No options trading. SogoTrade plans to offer option trading at some point in the future. 6. No mutual funds. SogoTrade currently does not have plans to offer mutual funds. 7. Automatic scheduled investments can only be scheduled by time, and not by amount. For example, at Sharebuilder, you can set your automatic investments to occur when you have enough money for the transaction in your account. Say you want to invest $500 in GE. When your account balance reaches that amount, Sharebuilder buys GE. SogoTrade does not have this option yet. 8. No pre-market/after market trading. 9. The research section seems to be an impoverished version of MarketWatch.com. 10. No physical locations to visit, should you want to talk to someone face to face. 11. There is a $50 fee to transfer your account to another broker. 12. $500 minimum to open account. 13. No fractional share purchases or free dividend reinvestment. 1. Terrible yields on cash, and no money market cash sweep options. SogoTrade does not, as of writing, plan to offer cash sweeps. 2. Any free trades that you earn can be used only for real time orders. Automatic trades incur the regular commission ($3, or $1.50 if you use the premium plan). SogoTrade is a relatively new discount broker that has the potential to be one of the best in the future. It has great customer service, and offers cheap trades. The broker can appeal to buy and hold investors as well as day traders. SogoTrade has some problems, but they are mostly in the lack of features area (options, in particular) rather than poor execution. As more features are added, the broker should improve. If you are content with a similarly priced broker, there is not much reason to move your account to SogoTrade at this time. Nevertheless, you may want to open an account to take advantage of the current free trade offer. As of writing, SogoTrade offers 100 free trades for 30 days when you open an account with $500 or more. You can also earn 25 free trades for every person you refer to SogoTrade. This SogoTrade review will be updated every six months, or as SogoTrade adds new features. SogoTrade will soon roll out a stock streamer. Sean Muir, who does PR work for SogoTrade, alerted me to it. Here are my thoughts. Easy to navigate, intuitive interface. Can input number of shares you own and at what price you purchased them, so you see your profits and losses in real time. While it is very aesthetically pleasing, a black background with white text can strain the eyes. Personally, when looking at something like this too long, I see afterimages when looking elsewhere. This may or may not be a big deal to users. It doesn't appear that one can add or subtract fields. For example, Bid/Ask sizes aren't shown, nor are the last trade sizes or last ticks. These fields do not appear to be available. Also, say I don't want to see a field, e.g., the volume field. It doesn't appear that I can remove it. The symbols are arranged alphabetically. That's great. But what if I want to arrange them in my own way? It would be nice to be able to sort the stock list by each field, and by the order in which the symbols are entered. While once a second updates are probably fast enough for just about everyone, this can be faster. Scottrade's streamer, for instance, updates much faster. It would be nice to see the major market indexes updated in real time on the same page as the stocks. As it is now, you have to click on the Market icon, which opens a new page and shows the market indexes on a five minute delay. This isn't a big deal, as SPY and DIA can be added to the streamer, but it would be nice to see the market indexes right away, without having to click or open a new window. To trade from the screener, you have to click on the row of the stock you want to trade, and then click the Trade icon at the top. Or, you can right click on a row and then click on Trade. It would be easier if there were a little trade icon right next to each row, so less clicks would be involved. Better still, conveniently placed buy and sell icons would make things even faster. Here are the icons: Trade, Chart, Research, News, Market, Active, Share, and Settings. Clicking most of them results in a new window or tab being opened. Clicking others, (e.g., Share--where you can email yourself or a friend) opens a new page in the same tab. You have to press the browser's back button to get back to the streamer. The share feature basically sends an advertisement for SogoTrade to the emails you specify, along with the message you compose. It doesn't seem to send anything about individual stocks, so perhaps this icon should not be placed with the others. Stocks on the Pinksheets don't seem to be available. Overall, I am impressed. The streamer is a welcome addition to SogoTrade's platform. I can't wait until options are offered. 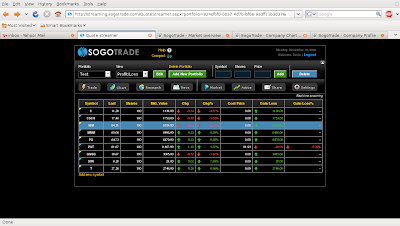 If the trades are not too expensive and execute well, I will likely move most of my trading to SogoTrade. Do you already use SogoTrade? Help others by posting a comment. ShengdaTech Inc, A Small Cap Gem from China?